1. The soldier felt frightened when he observed the majestic look on the prince's face. He was shivering and was unable to stand straight. He fell at the feet of the prince. 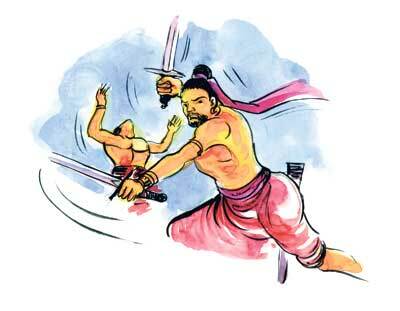 One of the soldiers of Prince Parakramabahu, who noticed this, soon killed this soldier. The prince was very angry over this. He reprimanded his soldier for acting without instructions. He stamped his foot and said, "You will be punished." 2. The deep voice of the prince, was enough to frighten Sanka's commanders. They turned to be supportive of the prince. Meanwhile, Prince Parakramabahu allowed the soldiers to take away the wealth accumulated by Sanka. The news of the death of Sanka spread all over the country. When King Kitsirimegha heard of it, he became furious. 3. He paced up and down in the palace for a while. 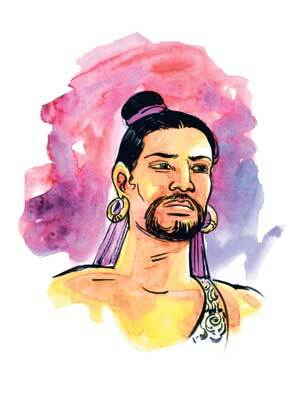 Thinking that Prince Parakramabahu was acting foolishly, he sent an army immediately, to somehow catch the prince. When the prince heard this, he got ready to face the army. He did not allow those soldiers to enter even the boundary of the palace. They were made to turn back. Kitsirimegha's anger grew and he instructed his men to somehow catch the prince and bring him to Kitsirimegha. 4. Several units of soldiers were sent on this mission. They were all defeated by Prince Parakramabahu. By this time, the prince was the ruler of the Budulutalawa area. The defeat of the king's soldiers and killing the powerful Commander Sanka, were great achievements of the prince. His fame spread far and wide. There were all sorts of rumours spreading, about the strength and power of the prince and his majestic appearance with which many were charmed. 5. In the meantime, soldiers of Sanka and the others who did not support the prince all this time, began to join his ranks. The prince treated all of them in a just manner. He helped the people too. This Prince Parakramabahu had strange ways. When he handled arms, he was very violent. But in ordinary life, he was very pleasant and acted like a saint. 6. The prince was extraordinarily kind and generous. As a result, not only the people of the village of Budulutalawa, but also those of the adjoining villages, loved and respected him. They had full faith in him. However, King Kitsirimegha still treated him as a youngster. He was annoyed that the prince was behaving in a reckless manner. He was so fond of the prince and he always entertained a fear that someone would harm him. 7. 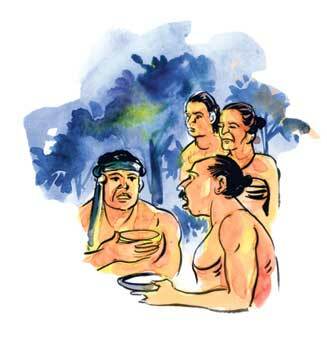 King Kitsirimegha summoned his commanders and ordered them to somehow bring back Prince Parakramabahu. He sent another contingent of soldiers to Budulutalawa. By this time, the prince was already making arrangements to leave for Budugama. But the people of Budulutalawa went and met the prince and begged of him not to leave. Then the prince replied, "Look here now, I am not satisfied being a leader of one area only." 8. The prince continued, "My dear subjects, my one and only aim is to unify the entire country. I am grateful to you, for the love and support you have extended to me. But I must leave now." The people could not say anything. The prince left the village.